Have you ever seen a dinosaur tooth? Some large dinosaurs have teeth as long as the width of this page. Could you imagine having to brush and clean those? But the teeth of some smaller dinosaurs are as small as a rat’s teeth. Dinosaur teeth vary in shape as well as size. There are sharp curved teeth, sharp straight teeth, bumpy flat teeth, and flat long teeth. 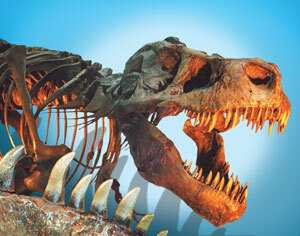 Many scientists believe these teeth can tell us what the dinosaur ate. Generally, sharp teeth are believed to be used for ripping meat and munching up bones. Animals that eat meat are called carnivores. Flat teeth are believed to be used for chewing up vegetation (plants, such as grass and tree leaves). Dinosaurs and other animals that ate plants are known as herbivores. That would make this dinosaur a carnivore. But why would God create animals to eat other animals? That doesn’t sound like a good thing for God to do. Perhaps there is something wrong with the idea that sharp teeth were designed for eating meat. Have a look at your teeth. What do you eat? If we looked at a giant panda’s teeth we might think it eats meat. It has two very sharp teeth, and lots of flat teeth behind them. But a giant panda does not use its teeth for ripping meat! It uses them to rip bamboo (bamboo is a hard, woody plant that can be used to build things). In fact all bears have teeth that look like they should chew meat. But bears mostly eat plants. This reminds us that guessing what a dinosaur may have originally eaten from the shape of its teeth may give us the wrong idea about what it ate. Instead, we should look in the Bible, the book that gives us the history of humans and the earth from when God created them. ‘And to all the beasts of the earth and all the birds of the air and all the creatures that move on the ground—everything that has the breath of life in it—I give every green plant for food’ (Genesis 1:30). But when Adam and Eve sinned, God cursed the whole earth (Genesis 3:19 ) because Adam and Eve were the rulers over the creation (Genesis 1:28 ). The Curse brought pain and suffering to the animals as well as to the humans. It was only after this time that some of the animals would have started eating other animals. 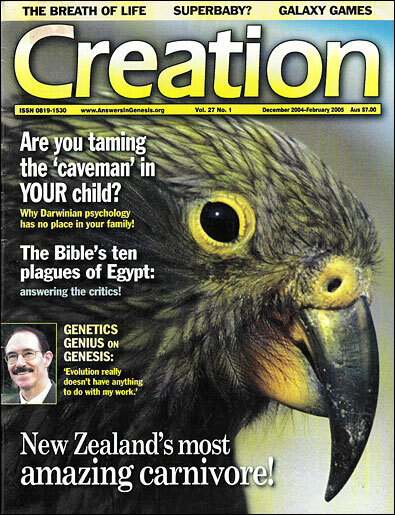 Recently, a British researcher watched a sheep catch and eat a bird (Creation 24(3), 2002; see page 30 this issue)! Maybe this gives us a hint as to how some animals could have become carnivores. People also ate only plants originally (Genesis 1:29 ), but after Noah’s Flood, God gave them permission to eat meat as well (Genesis 9:3). 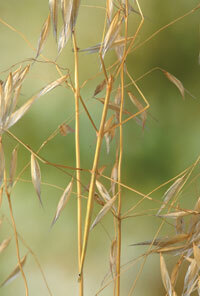 Most animals still eat grass or food that comes from plants, like grain or fruit. Here are some animals. Use the clues to work out what they are. I lay eggs, which are sold in a supermarket. People get cream from my milk. I come out at night and am a nuisance to fruit tree owners. I live in a stable. I am an Australian animal that sleeps high in gum trees. If you were an insect–eater you might not notice this stick insect and so it could escape being eaten! Can you find him? What an amazing Creator God is! God made the leaf and He made the insect to be able to look just like it! We call this camouflage. Click on the pictures below and print them for colouring in.